Wendy and I went to IKEA yesterday. Is there another store like it? I mean really – I sat in a beautiful leather rocker/recliner like I would see in the best furniture stores and then there are the little remote holders that hang over the arm of your couch (chesterfield for some). They have lights, whole kitchens, candles and plants, even offices and closets! We picked up an extra piece of furniture for ourselves. We have looked at it before and the timing seemed right in picking it up. Like most IKEA packages it weighed a ton! Wow is that stuff heavy. I might be in a flat box but the density of that stuff is incredible. We immediately brought it home and (once I struggled to get in the back door) I started to pull out the pieces. First of all I have to say – there was one piece that was real wood! That’s right Phil – “IKEA” might be Swedish for particle board, but this had one main piece made out of real wood! It has quite a few drawers in it, and so it took me some time to lay out all the pieces. Luckily I checked out all the pieces before doing anything with it. Wouldn’t you know there was one piece with a significant dent in the finished surface. ON to 1800IKEA and then a quick return trip to the store. When it comes to organization I have to say IKEA’s is in impressive. They had the replacement piece in my hands and me back out the door in less than 5 minutes. Congratulations IKEA – it was a good experience. The furniture is together and works well. 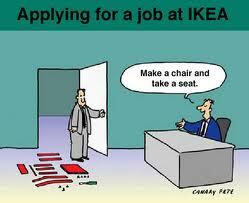 I stood back and Wendy said: “You are an IKEA carpenter”.